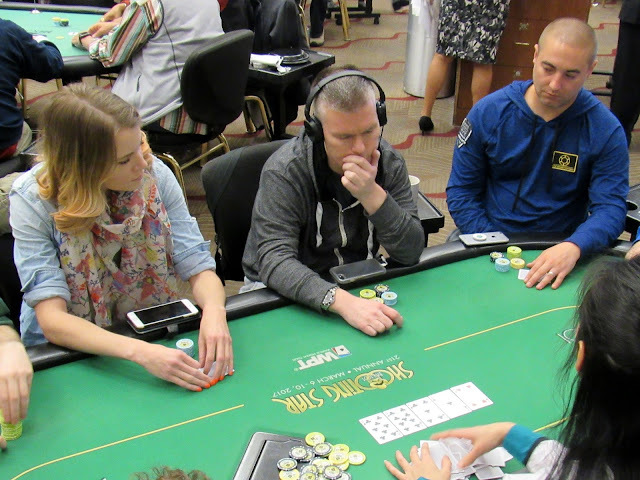 Play is still in the first level of the $2,100 Event, but Cate Hall has already chipped up. The board read [8c][9c][5c] and action checked to Chance Kornuth who bet 200, only to see both Cate and David Forster call. The [Ac] turn saw action check to Chance, who fired again for 1,000. Cate quickly called, and David threw his cards into the muck. When the [4h] hit on the river, both players checked, and Cate tabled [Kc][Kh] for the second nuts. Chance lost that pot, but was later in another pot with David. David turned a straight and check-raised all in, only to see Chance snap call with the nut flush. Chance had David covered, and so he will be eliminated from today's play. Blinds will be going up to 50/100 shortly.